What is free range chicken farming? 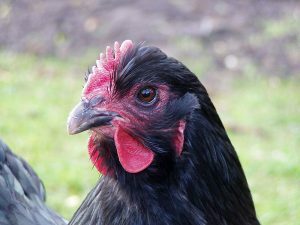 Free range chicken farming is the practice of having chickens that are raised mainly outside of pens and runs and only enter the coop at night. 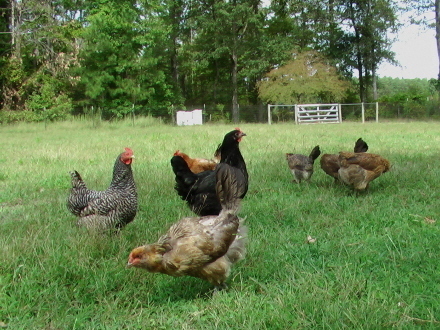 The chickens are allowed to roam free throughout your yard during the day, where they forage for much of their food. Although most chicken owners still provide them with supplementary food in their feeders and of course, plenty of fresh water. The advantages of free range chicken farming are numerous. One of which is that if you are selling the eggs or the chickens you will get a better price, as people are willing to pay more for free ranged chickens and eggs. This is because the eggs and meat are known to taste better, are considerably healthier and more nutritious with higher levels of nutrients and less fat. The cost of feed for free range chickens is generally less because the chickens will eat numerous bugs and a large variety of plants when they are outside foraging. You also don’t have to spend more getting them grit and rocks as they will find their own grit. Because their diet is so varied this way and much more natural, is why free range chickens tend to produce these more nutritious eggs. 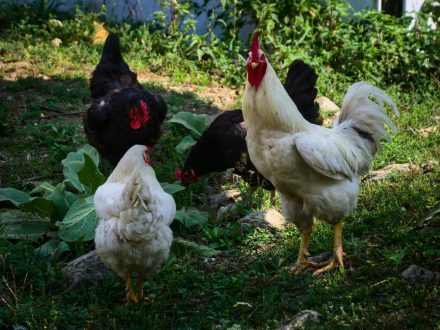 Another advantage to free range chicken farming is that chickens which are free ranged will likely weed and debug your yard for you because of their preference for weeds and bugs to store bought feeds. If you have a small garden and need manure, the chicken poop is an excellent manure source which will save you on additional costs. Free range chicken medical costs tend to be cheaper. Especially if you decide to go with herbal and natural treatments for minor ailments such as lemongrass for detoxification, guava, chilies and garlic work as antibiotics and there are leaves that can be used as anti-mite and anti-parasitic medicines such as ipil-ipil leaves. You also don’t need to spend any more time cleaning up after them and the coop stays cleaner for longer, since they are not spending as much time in it. Free range chicken farming has its disadvantages too however, and you should take this into consideration when deciding whether or not to free range your chickens. Free range chickens will often poop everywhere. So if there are areas of your yard you may not want to get the chicken poop, you will have to find a way to block the chickens from those areas. Free range chickens may also lay their eggs everywhere which can make it difficult to collect the eggs. However, this one is fairly easily remedied by keeping the chickens in the coop a little longer in the mornings until they’ve layed their eggs for the day and then let them out the rest of the day after that. Other concerns though, the chickens may stray into neighboring homesteads and upset your neighbors. The chickens also like to eat up the greenery in your yard and may go after some plants you don’t want them to. So, some parts of your yard may become more bare which can make your yard less attractive. And probably the most upsetting, free range chicken farming certainly makes the chickens more prone to predators. Because they are left out on their own, predators have a much easier time getting at the chickens. One way to raise free range chickens without some of the disadvantages of free range chicken farming is to use a modified free ranging method. You can do so by using paddocks or mobile pens, such as chicken tractors. This modified free range chicken farming method helps to eliminate some of the problems such as chicken poop everywhere, your good plants getting pecked at, and lack of safety from predators. You can build a simple pen by using chicken mesh wire and a few metal or wood posts. Make sure it is light for easy portability. Move it every so often so that the chickens have fresh grass and other plants to forage in and so they also don’t leave too much poop in one place. Whether you go for the full or modified free ranging method, free range chicken farming is an excellent way to ensure happy, healthy chickens with wonderfully nutritious eggs and meat. I enjoy talking with anyone about the keeping chickens. But which isn’t some thing I carry out! I love looking at a post that will make folks consider. Also, thanks for letting me to be able to comment!